My latest win is a box of crisps from Tyrrells. I’ve been entering mostly Twitter competitions at the moment as they are east RT to win. I find I can enter 100’s on my lunch break at work. Anyway I’ve never tried Tyrrells crisps before and they sound really nice. 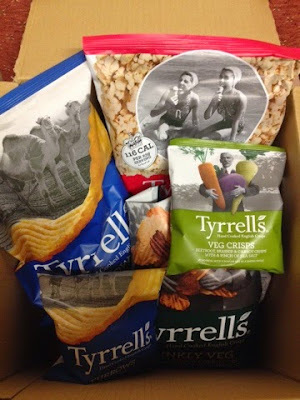 I won a box of Tyrrells Crisps back in January and these turned up this week! There is an assortment of crisps, popcorn, vegetable crisps and a packet of fried beans which I am eager to try! Thanks Tyrrells! My win today was of a book from Goodreads (which is one of my favourite websites ever!) called The Great Zoo of China by Matthew Reilly. When I saw this competition I really really wanted to win a copy of this book, as I have read many of his other books. Which include Scarecrow, Iceman, Seven Ancient Wonders, Contest and Area 7. Matthew Reilly is a fantastic action, thriller writer. His books are well thought out with great lead characters. So I am well excited to add this book to my collection!